LEXINGTON, Ky. (July 8, 2014) — The University of Kentucky’s Human Development Institute (HDI), through its Supported Higher Education Project (SHEP), works with Spalding University in Louisville, the third post-secondary institution approved by the U.S. Department of Education for a Comprehensive Transition Program (CTP). The program provides opportunities for students with intellectual disability to enroll in college. SHEP offers support to these students in class and outside the classroom as well as providing professional development and technical assistance for faculty and staff. Spalding joins Murray State University and Bluegrass Community Technical College in offering this innovative program for students who, in the past, have been underrepresented on college campuses. 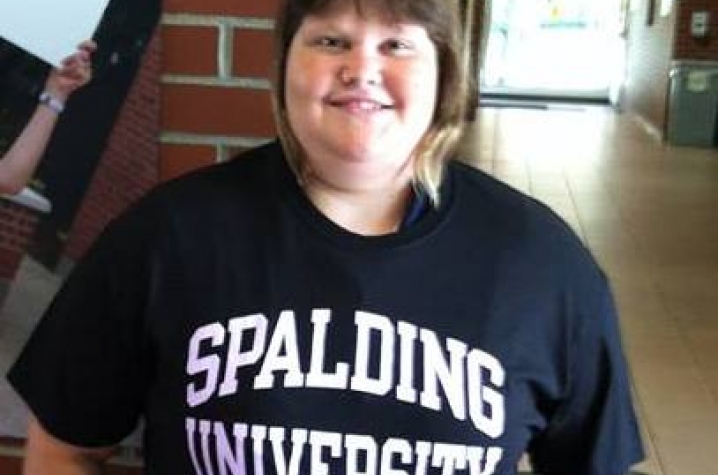 Tricia Baldwin, daughter of John and Pat Baldwin, is the first student to be enrolled in the Spalding CTP program. Tricia says she has found a place on the Spalding campus. “I feel happy about attending Spalding University and having a chance to show how much I can do," she said. "Plus I like making new friends." Her parents are proud and supportive of their daughter, and they say the CTP has provided her with important opportunities for personal growth. "Tricia's experience has provided her with a new outlook to the future for better employment as well as an avenue for her to be accepted for what she can achieve, despite her disability,” said Tricia's mother, Pat Baldwin. A provision of the Higher Education Opportunity Act of 2008, CTPs support students with intellectual disability who wish to continue their education beyond high school to prepare them for independent living and better jobs. CTPs offer academic advising and a structured curriculum that includes participation in fully integrated classrooms with students without disabilities. Enrollment in a Comprehensive Transition Program allows students to apply for federal financial aid and have access to state financial aid opportunities. Another key feature of CTPs is the use of peer mentors to support students with intellectual disability in the classroom and social opportunities. Barry Whaley, SHEP project director, says the Spalding CTP is an important component in an ongoing drive to improve access to education for adults with disabilities throughout Kentucky.